Also, I am queer. This is part of my identity, but not one that I chose for myself, though it has been a long, slow road in recognizing it within myself. And it’s not unrelated to being a mycologist — that feeling of kinship with fungi because they’re misunderstood and misrepresented? I think that comes from my queerness. Growing up in the military, in a family from rural Appalachia, there was no way to express certain feelings, even to myself. My own attractions (call me pansexual, if you need a word) and my own gender expression (I am cis-male, but my concept of masculinity is radically different now from anything I had access too as a young person) were confusing and contradictory as I grew up, and I did not even have the vocabulary to talk about them. Now, looking back, I can recognize that certain discomforts and confusions stemmed from the conflict between how I was feeling and how society expected me to feel. But, not having even the ideas, much less the vocabulary, to think about it, I had trouble recognizing what was going on; I just felt other and different. I came into accepting being queer and being a mycologist at roughly the same time — both were long processes, and I think they reinforced each other. As a queer man and a scientist, things have been looking a little dark since the election. I think anyone reading this blog probably understands some of why, and I don’t really want to re-hash it here. After the election, I got this tattoo on the top of my left hand. It’s a pink triangle. I had thought that this symbol was pretty universally recognizable; I wanted to be more visibly queer to those around me (since I date women — as well as men and non-binary folks — I have the privilege of passing as heterosexual in society), and to remind myself of the importance of my own identity. It is important to be visible in a time of strife, to stand up and say HERE I AM, to look oppression in the eye and not back down. 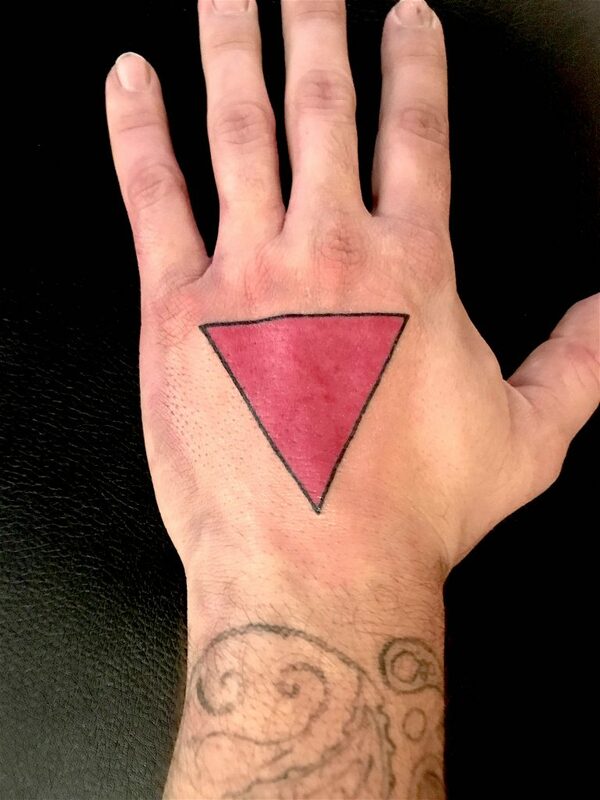 Interestingly, it seems that the pink triangle is a bit less recognizable than I had thought it was. It was used by the Nazis to mark homosexual men in the Holocaust, and then later re-claimed by the gay community as a Pride symbol. The re-appropriation of a Nazi mark as a symbol of pride in identity seems particularly appropriate at the moment, given fears of an impending Muslim registry in the United States. This tattoo is intended to say “I stand proud in the face of bigotry and hate, and I refuse to be silenced.” Even though I have had to explain it a bit more than I expected, it still serves its purpose: there’s no way to explain what it means without coming out as part of the explanation. I am more visible in my queerness since I got this tattoo. And I think this is something else that has drawn me to mycology, and to eventually identify as a mycologist (instead of one of the myriad other possible –ologists I could have ended up as). There is an acceptance in the mycological community that I find lacking in other branches of science; we are friendlier, more open to difference and understanding, and more willing to consider that all might not be as it seems. I think that anyone who spends a large part of their life studying fungi must have a bit of that feeling of otherness, which leads them to feel kinship with the strange lifestyles and habits of the fungi. Anyone who spends enough time studying fungi becomes aware that the world is a vastly stranger than what they were taught in school, and that the rules need not always apply; I think that this makes us more compassionate, more willing to accept the uniqueness of our colleagues and friends. Related to that, I would like to start the process of planning an LGBTQIA meet-up at the next Mycological Society of America meeting (Athens, GA, 16–19 July 2017), to help bring together those of us that feel this way, and to continue a tradition of mycology being a wonderful, welcoming place for odd ducks like me. Anyone want to come? Hi, Roo! My name is Mariana. I’m finishing my master with polypores in UFSC (Federal university of Santa Catarina – Brasil). I’m Maria Alice’s student, I guess you know her. (In fact, my master’s professor is Ricardo Drechsler, but they work together, and my conection is more deeply with prof. Maria). Well, I read your text and it is amazing! realy. I love mycology, very much I guess. I spend many time of my day thining about fungi. And I agree with you when you write that they’re under-studied, poorly comprehended, misunderstood, and misrepresented. I’m gay too. Better: I’m lesbian. I prefer leave the labels for the products but sometimes it’s necessary to use them. So, lesbian here reflects the resistance to gender oppression at the same time against the oppression of men against women. Also, I don’t fit mysself into the binary pattern, too. Man! It’s a big discussion, so thank you to start it. 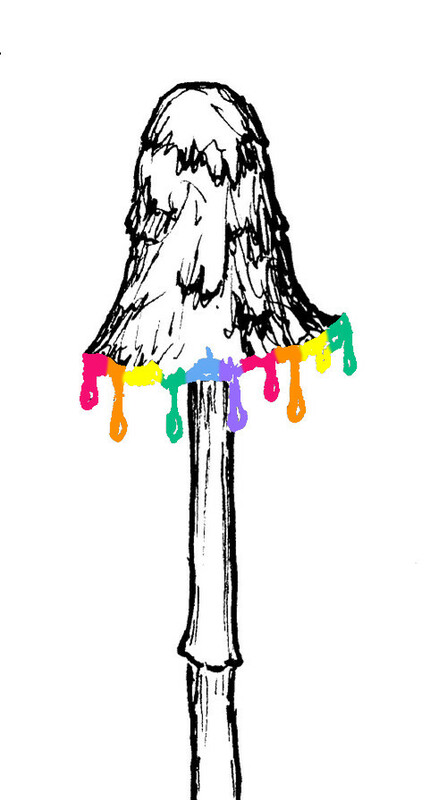 Let’s color the Mycology. Let’s show our true color. I won’t go to the Mycological Society of America meeting because brazilian researchers are poor! and it is a little bit far away but the LGBTQIA meet-up is gonna be great!! I don’t know you but I fell a conection, like a micelial conection, that conect everything! Let’s be micelial. ps. : I love the Coprinus color-comatus (let’s make a shirt with that draw?). May I add you in facebook? Sorry for my bad English I wish I had written more and more clearly, but I do not articulate well in your language. Thank you for the opportunity.